TULSA — Critical cases of animal cruelty across Tulsa County often result in emergency medical care for the abused. That medical care can cost area rescues thousands of dollars a month, and they need the public’s help. Abused or neglected animals rely on donations and fosters to undergo not only life-saving measures but also a safe place to live. Animal Aid of Tulsa is one area organization doing just that, but it takes a village to keep it afloat. Gabriel, a 2-year-old Vizsla mix, is just trying to adjust. His story is one we may never know, but his interactions with people say a lot. For instance, he doesn't like men. If a man is present, he tends to bark and feel uncomfortable. His foster parent, Victorious Salsman, said when he was found he was seriously injured and malnourished. "After he was hit he went for days injured,” Salsman said. It's believed Gabriel was hit by a car, then dragged. Rescuers found gravel in his skin and road burns all over his body. He had also lost function of his back legs. “There's a lot of rescues that can't afford the severe cases, so we take on those cases,” Courtney Goff, fundraising coordinator at Animal Aid of Tulsa, said. 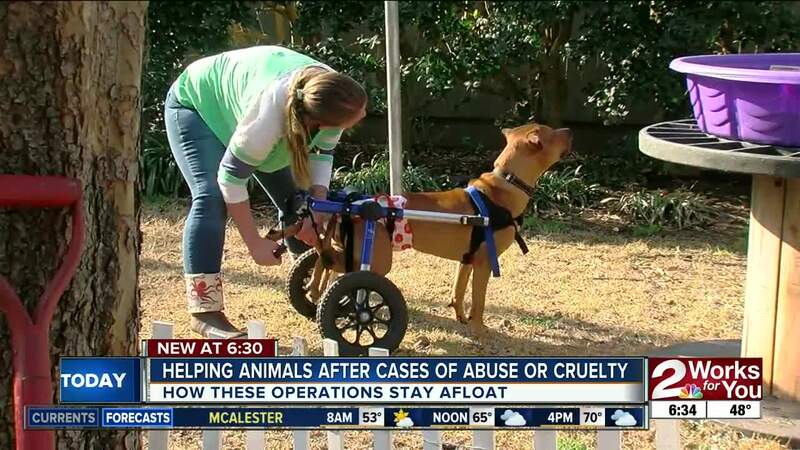 Animal Aid of Tulsa said it handles the areas most critical cases of abuse. The rescue then fundraises to afford its nearly $40,000 a month vet bill. “We currently have 26 dogs and 14 cats,” Goff said. “You learn that with an injury or sickness it usually has come from abuse, we do see a lot of that." These animals rely on fosters and money raised by the community. Without those resources, neglected and abused animals may not get care. And there's a critical need for both. “At times we don't have the money,” Goff said. We do not like to say no, but sometimes we are completely full because we don't have a shelter and there are so many medical cases. We don't always have a place to put an animal." Animal Aid needs more fosters to give animals like Gabriel a second chance at life, and the opportunity to find a long-term and loving family. The animals go through a lot, and like Gabriel, do sometimes require extra care. But once the walls come down, the animals can become fully trusting of their caregivers. For Gabriel, he begins to regain trust in humans thanks to his foster. He’s now looking for a forever home. “That moment, when he actually learns to trust you, it's complete,” Salsman said. "For every ounce of energy that it takes to put into his care, he gives back pounds of love." If you’d like to adopt Gabriel or learn more on how to contribute to these animal's care, you can visit their site here .